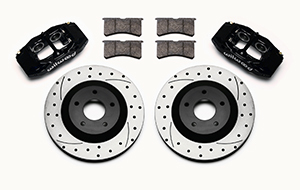 SLC56 front caliper, pad, and rotor kits are engineered as high performance street and custom show replacements for Corvettes and hot rods using Corvette suspension. These kits combine the high-tech styling and superior performance of the SLC56 calipers, 12.8” diameter SRP series dimpled and slotted e-coat rotors, and the positive response, long wear, high fade resistance, and easy clean properties of the BP-10 compound Smart Pads. These kits bolt directly to the front spindle of any model C5 or C6 from 1997-2013, without the need for additional brackets or adapters. Note 1. Kit fits 97-2004 C5 all, 2005-2013 C6 Base Models w/ 12.80 diameter front rotor. Note 2. 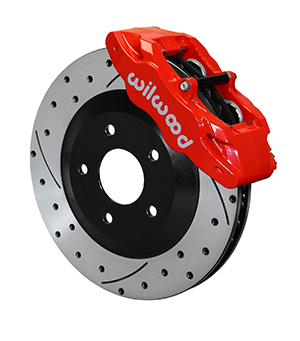 SLC56 caliper kits have been checked to clear Z06 model wheels. All other OE and aftermarket wheels should be checked for proper clearance. . Wheel spacers may be required on some applications.